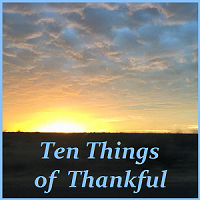 Thank you for your part in making our Ten Things of Thankful blog such an uplifting experience! Please take a moment to answer the following question in the comments section below. It's a fun way for us to get to know each other a little better. Looking back at this year, what is one of the most important things that took place in your life? Please take a moment to answer the following questions in the comments section below. It's a fun way for us to get to know each other a little better. If you had the magical powers of Santa Claus and could bestow one gift on all the children everywhere, what would you give them? Please take a moment to answer the following questions in the comments section below. It's a fun way for us to get to know each other a little better. If you could have one living person that you haven't seen recently show up at your door on Christmas Eve, who would you choose? Please take a moment to answer the following questions in the comments section below. It's a fun way for us to get to know each other a little better. What is one of the best (tangible) gifts you've ever been given, and what was the occasion?